After just five weeks of being together, we played our first gig and we had a taste for more. The music we were making was sober and emotional, especially because of Margriet's vocals, and it wasn't long before we could be seen regularly on stage. 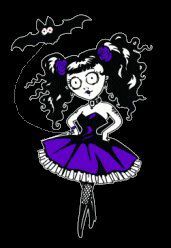 However, a few months later Hester decided to quit the band and Diana joined for a short timeafter which she passed the drumsticks to Conny. a moment we will never forget. The Asrai are small, fragile, female beings who turn into a puddle of water when they are captured or exposed to sunlight. This makes them unreachable. We felt this was a good representation of our music. When Conny left the band, Karin decided to play the drums instead of the guitar and our first male guitarist entered the band. Many gigs followed with the same line-up for eight years. We wanted to record a CD,unfortunally it was that Elfriede and Bert decided to leave the band, and for the last time we went to the studio and recorded the last tape together called Asrai. Soon afterwards we found good replacements in Serge on guitar and Leah on bass. It wasn't long before we were noticed by Michael Zoller from Poison Ivy Records and a German release of As Voices Speak was issued.. However, Serge's career had taken off, so he left the band, this time it wasn't so easy to find the right replacement, eventually, Jos took over as the new guitarist. We also wanted to explore and deepen our music, so we started searching for a keyboard player or a second guitarist, and this was when we discovered Rik. However, Jos became so successful with his other band, Grendel, that it was difficult for him to combine the two bands, so only four of us played on the next CD. We met Roman Schoensee and we decided to record the next CD at his studio, the beautiful Lake Studio. Unfortunately, a short time before we went to the studio, Leah became ill and we asked Martin, a good friend and brilliant bass player, to fill in for her until she had recovered, and thus we recorded our demo. By now Transmission records was interested and gave us the opportunity to record the album with a larger budget and one of the better mixers, Sascha Peath. We also wanted Roman to be our producer. Sadly, before we went to the studio for the second time, it became clear that Leah wouldn't recover enough to play the bass a lot, and she decided to leave the band. Hans Pieters, and recorded our next CD, Touch In The Dark. "Touch in the Dark" was been released in most European countries as well as in Asia and North and South America. was released may 6 the. The video-clip made for their single "Pale Light" was made by the versatile and talented duo Marcel de Jong and Jelle Swetter . Our heart beat faster when we saw the artwork of Marcel de Jong, not only multi talented but also with the right atmosphere. We also fell in love with the cute artwork of Maud Mulder. 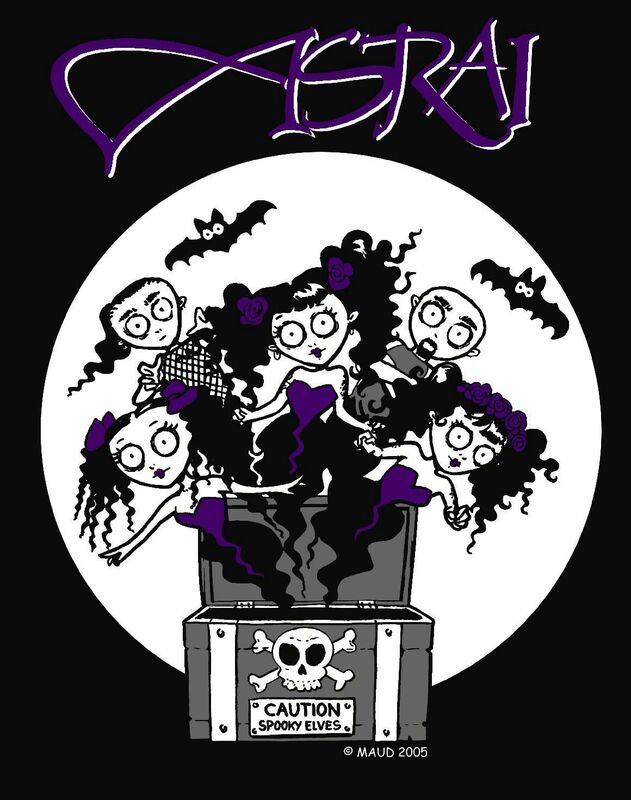 Based on the Betty Bones she created our merchandise line. And again the videoclip was made by Marcel de Jong and Jelle Swetter and Maud Mulder. Asrai won the Essent award. 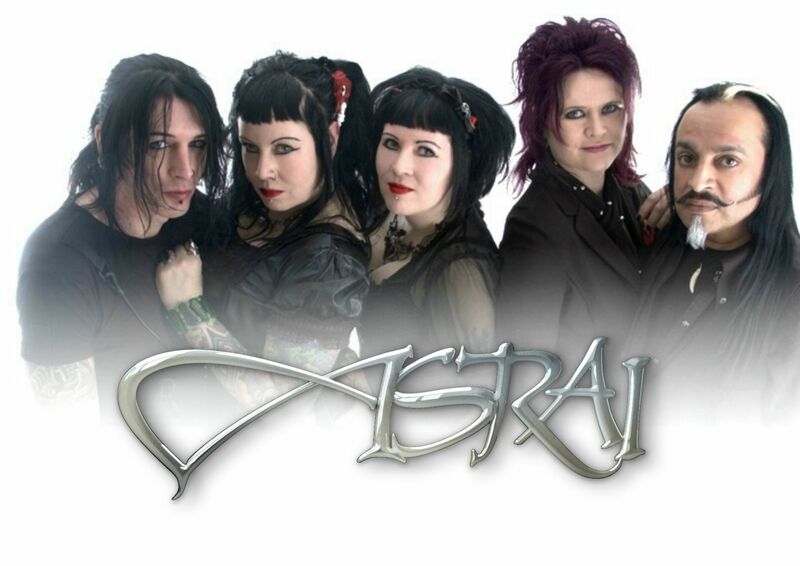 Asrai did several tours and ened up in studio again to work on their next CD. Again at the Excess Studio with Hans Pieters and this time with Sascha Peath as our producer. For the finishing touch some parts were recorded at the Gate studio by Sascha Paeth. and Amanda Sommerville. 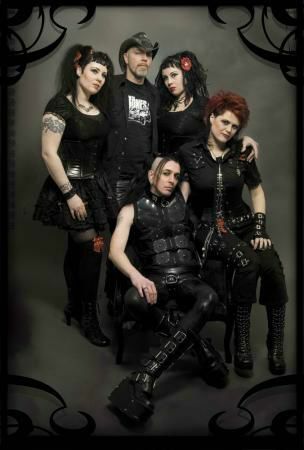 We did a photo shoot with Alex le Heux which was used for the artwork. After the preproduction it became clear that Transmissions wouldn' be able to release our next album. And end 2006 we'e pround to announce that we're signed by Season of Mist. The cover of the "Sour Ground" single was made by Marcel de Jong who also did the "Pale Light" and "In front of me"
Back to the Excuss Studio where we recorded All seems so Hollow . We are happy to work together again with Sascha Peath who produced the song. March 2013, After almost eleven years Martin decided to go his own musical way. 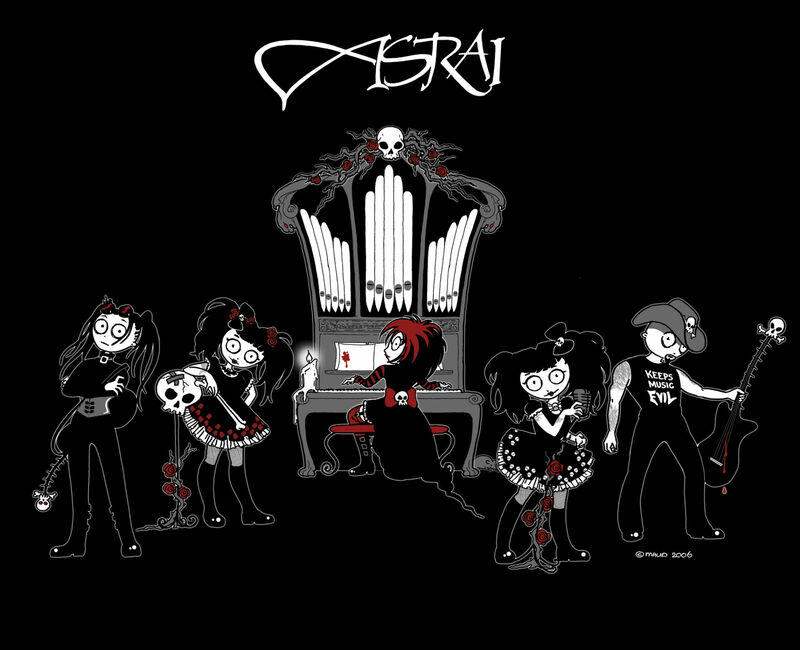 After seventeen years, Rik decides in September 2016 to end his musical journey with Asrai. And not long time after Rik's decision Jett also decided to quit the band. Margriet, Manon and Karin didn't had to think long to decide that for Asrai it's not the time to quit, we would miss making music, and being on stage too much. We were looking for a new guitarplayer and we didn't had to think twice to ask Jacqui Taylor. We bumped into eachother backstage at Eindhoven Metal Meeting, and there was a good connection instandly, and that was exacttly what we needed. Dispite of the long distance we found our own way to pratice and in April 2017 we finally got the chance to be all together on stage.... and it was wicked! 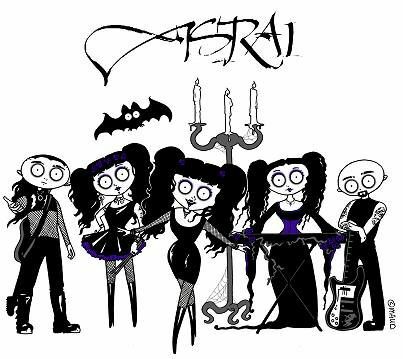 Already thirty years has gone since we changed the band name into Asrai. So much has happened. What a beautiful time it was, so a for us a good reason to do something special. We got through our collection and selected our favorite songs. Now we can present you: Hourglass, a musical journey through 30 years. With special versions of our favorite songs. With a special squeal/ remix from Something made by Hans Pieters. Introducing Jacqui on guitar. After thirty years this is a new begin for what the future will bring us.